A heated stone massage is a massage combined with the use of smooth, heated stones. The warmth of the stones seeps deep into the body, relaxing tense muscles and easing tension. Heated stone massage is extremely relaxing and soothing. Before you arrive, the practitioner sanitizes the stones and heats them in a bath of water. You usually start face down, with the practitioner working on your back. First, the therapist warms up the body with relaxation massage then massages you while holding a heated stone. As the stone cools, the therapist replaces it with another. Many stones of various shapes and sizes may be used—larger stones on the bigger muscles, smaller ones on smaller muscles. 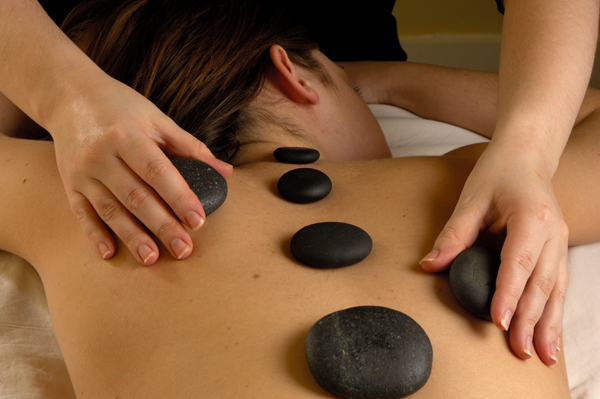 A full-body massage is completed with the stones, including the arms, legs, shoulders, feet, neck and face. Be sure to speak up if the stones are too warm or the pressure is too intense. The full massage is kept to between 45 minutes and 1 hour, so as not to overheat the person. The benefits of heated stone massage may include: releasing tight muscles, deep relaxation, improved sleep, increased circulation, reduction in inflammation, and improved immune function. Heated stone is a more gentle form of massage and can be tolerated more easily by those who are more sensitive or have chronic conditions, such as fibromyalgia. Hot Stone massage is not appropriate if you have diabetes, high blood pressure or heart disease that is not under control. If you have edema or uncontrolled swelling, if you overheat easily and do not like hot humid weather, heated stone massage may not be for you. This therapy is not appropriate for pregnant women or those who have a sunburn or have recently been very overheated. If you are menopausal, heated stones may trigger hot flashes. If the outside weather is hotter than 28 degrees Celsius and you are not able to be in an air-conditioned place, it is not a good idea to have heated stone massage. Note: These treatments are not intended to replace medical or psychological care, but they are excellent complementary therapies. If you have a serious medical or psychological issue, please seek care from a medical doctor or the appropriate psychological therapist. Bonnie is happy to work in co-operation with other treatment methods you may be using. Bonnie is happy to accept debit, visa, master card, or cash. Sliding fee scale available for those who have a low income and do not have insurance benefits. If you are unable to make your scheduled appointment, Bonnie requests 24 hours notice. A missed appointment fee may apply.